Following the crowning of Miss America 2015, Kira Kazantsev, the social media broke out in harsh words criticizing everything from her physical appearance, her talent, and her national origin. Many of these comments, although still hurtful, were plain and simple ignorance from people who are unfamiliar with the organizational structure of the Miss America Organization. 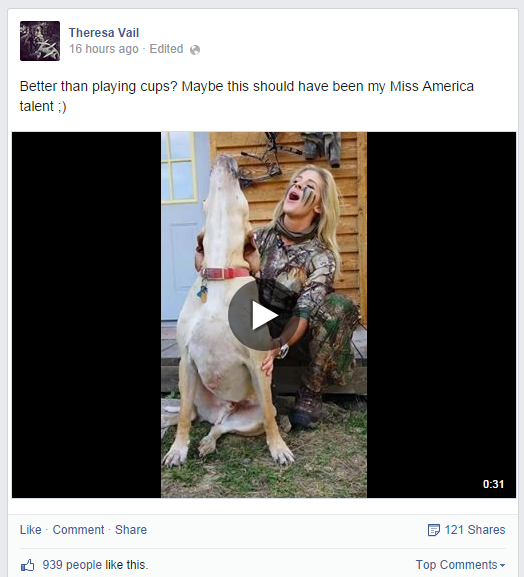 The worst case scenario, however, happened when a former Miss America contestant posted a video of herself “singing” with her dog. As a former contestant, not only does she understand what it feels like to be on stage, but to have a talent that people may not understand. Originally, Theresa wanted to perform archery, her true talent, but was denied for liability reasons. She taught herself an opera song off Youtube, performed it on finals night, and did not advance past the talent portion. Thankfully, not all of the Miss America family resents Kira and her talent selection. Many titleholders have stood up to defend Kira, solidifying the consensus that the 5th Point of the Crown is Sisterhood. In fact, “former” Miss Americas themselves have taken a stand to defend her, having stood in her position once. Mallory Hagan, 13 and Teresa Scanlan, 11 have both publically posted on their Facebook. Gretchen Carlson, 89 took the next step and defended Kira live on her Fox newscast. In addition to a former Miss America herself, contestants who stood on stage with Kira have come to her defense. Lets remember that these girls came out to win. They were competing against her, yet still, despite not winning, have her back. You’re not alone, Kira. The Miss America Sisterhood has your back.